¿Por qué no despierta mi paciente? Neumoencéfalo masivo tras craneotomía programada. Our article is about complications arising from intracranial neurosurgery that could be the cause a delay in awakening of patients one surgery is is done. 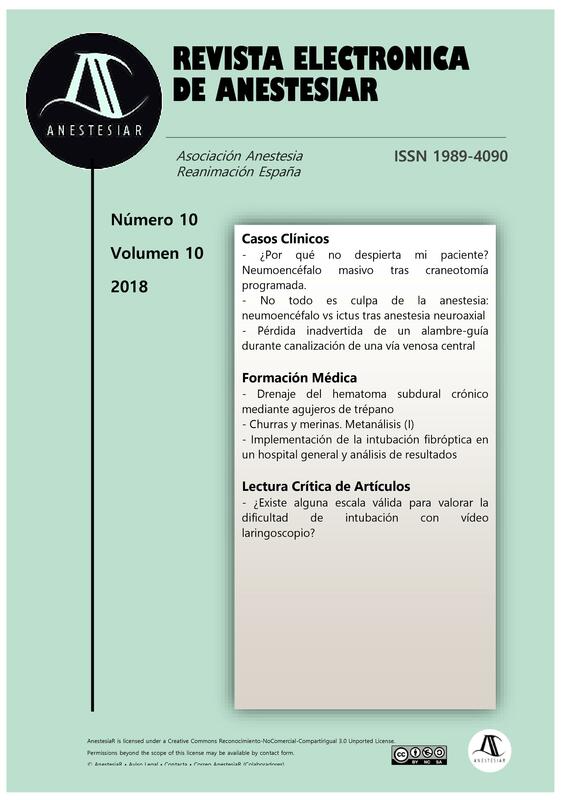 In this case is about post craniotomy pneumoencephalon (regarding a situation we had at Albacete hospital), its prevalence, clinical implications and complications associated to it, as well as its handling. 1-	Haugen FP. The failure to regain consciousness after general anesthesia. Anesthesiology. 1961;22(5):657-666. 2-	Reasoner, D.K., Todd, M.M., Scamman, F.L., Wamer, D.S. : The incidence of pneumocephalus after supratentorial craniotomy. Anesthesiology 1994; 80: 1008-1012. 3-	Rolston JD, Han SJ, Lau CY, Berger MS, Parsa AT. Frequency and predictors of complications in neurological surgery: national trends from 2006 to 2011. J Neurosurg. 2014; 120: 736–45. 4-	Puntis M, Garner A. Management of pain following craniotomy. Br J Nurs. 2015; 24: 740–44. 5-	*Carlos B. Dabdoub, Gueider Salas, Elisabeth do N. Silveira, Carlos F. Dabdoud. Review of the management of pneumocephalus. Surg Neurol Int. 2015; 6: 155.